In an earlier post, I pointed out that that the identity of "red" and "blue" states today is completely different from what it was in the 1930s. In fact, there have been significant changes since the 1980s. For example, New Jersey is now often called a "blue" or even a "deep blue" state. The figure shows the Democratic share of the vote relative to the whole nation in Presidential elections from 1916-2012. 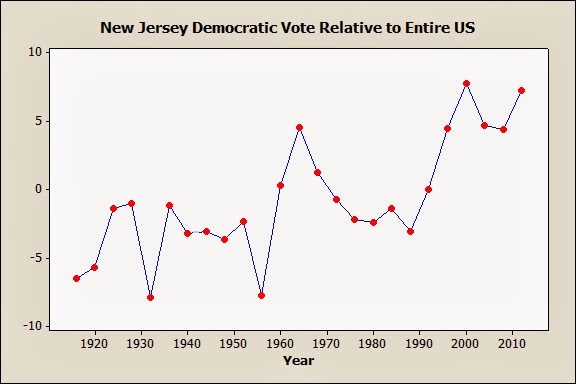 From 1916 to 1992, New Jersey leaned Republican. For example, in 1992 the national vote went for Bill Clinton over George HW Bush by 43%-37%, with 19% to Ross Perot. In New Jersey, it was 43% for Clinton, 41% for Bush and 15% Perot. But starting in 1996, the Democratic share of the vote has been 5 to 7 points higher in New Jersey than in the nation as a whole. The timing of the Democratic shift in New Jersey was about the same as the Republican shift in West Virginia, although it hasn't been as large. The estimates in the first column are from a standard regression and those in the second column include fixed effects for countries (ie they are based solely on variation within countries). The two sets of estimates are remarkably similar. The estimated effects are also large enough to be important: going from 1% to 3% inflation is estimated to go with 0.5% higher growth (e. g., 2.5% vs. 2%). I suspect the main reason for the difference from the conclusions of some other studies is that most of them looked at a large number of countries, while I just looked at 16 high-income countries. Even the studies that distinguish between high-income and developing countries usually define high income pretty broadly, like all OECD countries. Kevin Williamson has an article on poverty in Appalachia. In it, he quotes the publisher of a local newspaper in Owsley County, Kentucky: "And when you have that many people on the draw, that’s a big majority of voters." Oddly, he doesn't mention that Romney got over 80% of the vote in Owsley County, and this whole part of the country was a Republican stronghold in 2012. It wasn't always this way: I show results for West Virginia because state voting data is easier to find and work with than county data. 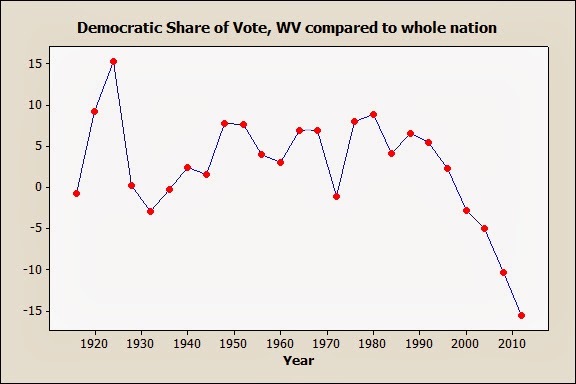 The figure shows Democratic share of the vote in West Virginia minus the Democratic share in the whole country for presidential elections from 1916 to 2012. A positive number on the y-axis means that the Democratic candidate did better in West Virginia than in the country as a whole. For most of the 20th century, West Virginia leaned Democratic (the big gap in 1924 was presumably because the Democratic nominee was from West Virginia). In 1988 it was one of only ten states to go for Michael Dukakis. Since 1988, the relative Democratic vote has dropped in six straight elections, and the state is now strongly Republican. The fact that the change didn't start until about 1990 suggests that it's not primarily about race, and its steadiness since then suggests that it's not primarily about the personal qualities or styles of the candidates. So what caused it? I'll offer a hypothesis, although I don't have time to test it: voting participation has fallen among people with low income and education as mining and factory work has given way to unemployment or irregular employment. So an increasing share of voters are middle-class people who disapprove of those who are on "the draw." It's often said that Americans believe in equal opportunity, while Europeans believe in equal results. Conservatives celebrate this as an example of "American exceptionalism," while liberals regret it as a kind of false consciousness. Is it true? There's surprisingly little evidence, but thanks to the International Social Survey Programme that's starting to change. I was deliberately ambiguous when I said "Americans believe in equal opportunity." That could mean that we value it highly. I looked at that issue in a previous post; on the evidence discussed there Americans are not especially interested in equal opportunity. It could also mean that we believe that we have it. That's what I'll look at here. The ISSP asked about the importance of a number of factors for "getting ahead in life." The factors are coming from a wealthy family, having well educated parents, being well educated yourself, ambition, hard work, knowing the right people, giving bribes, and having political connection. People rated each one separately, on a scale of "essential" to "not important." I made an average rating of each for all the countries in the ISSP, and then, guided by the results of a factor analysis, combined the items into three scales. The first scale is the sum of coming from a wealthy family, knowing the right people, giving bribes, and having connections. The second is ambition and hard work, which would generally be accepted as things that are up to you. The last is education and parent's education. This is ambiguous: your own education is at least partly up to you, but your parents' education isn't. The conventional wisdom is right up to a point: Americans believe that effort is important. But Americans also rate the factors I call "who you know" as more important than people in most Western European nations. Belief in a meritocratic society, where effort matters and who you know doesn't, seems to be strongest in New Zealand. It's interesting that the French, often regarded as pretty cynical, are second-to-last in the perceived importance of "who you know." Finland, Japan, and Denmark rank low on the perceived importance of all three groups. This could be because of cultural or linguistic differences, or because people see them as egalitarian societies in which nothing will do that much to help you get ahead (or fall behind). In the last few days, Charles Blow and Paul Krugman have both written about a Pew survey that asked whether humans and other living things "have existed in their present form since the beginning of time" or "evolved over time." Pew reports that partisan differences have widened dramatically since 2009: Democrats have become more likely to believe in evolution and Republicans have become less likely. Although the Pew report mentions only the 2009 survey, the question has been asked a number of times since 2005. Here are the results--the numbers represent the percent saying "evolved" minus the percent saying "existed in their present form." The 2009 survey is an outlier--everyone was more likely to express support for evolution than they were in the surrounding years. I'm not sure why the results from this survey should be so different from the others, but I noticed that it focused on science, while the others had a mix of topics. So perhaps people felt more inclined to go along with the scientific consensus after answering a lot of questions on science and technology. Another possibility is that people who didn't have much knowledge of science or faith in science were less likely to agree to participate in a survey on science. In any case, any comparison involving the 2009 results should be taken with a grain of salt. 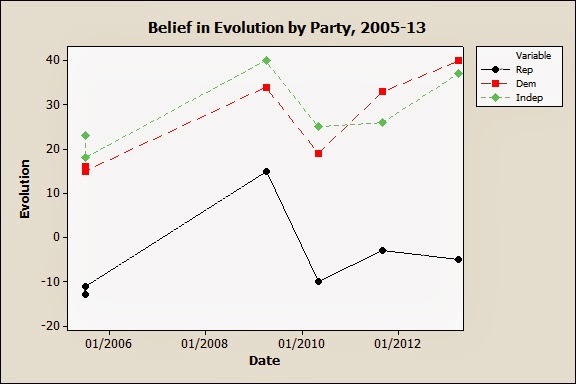 If you omit the 2009 survey, partisan differences have become a bit wider over the whole period, not because Republicans have become less likely to believe in evolution, but because Democrats and independents have become substantially more likely to believe in it. A 2010 survey sponsored by Vanity Fair magazine and 60 Minutes asked "Which of the following American writers has made the most important contribution to literature -- Mark Twain, Ernest Hemingway, Toni Morrison, Emily Dickinson, Dan Brown, or Stephen King?" 46% said Twain, followed by 18% for Hemingway. Dickinson narrowly beat out King (8.8% to 8.6%). 3.5% chose Morrison, and Brown was last at 0.6%. The rest said that they couldn't or wouldn't choose. I leave Dan Brown out since only a handful of people chose him. People who chose Morrison clearly stand out in terms of support for Obama (only 2% said he didn't deserve to be re-elected). However, people who chose King are substantially more favorable than those who chose Twain or Hemingway. It's hard to be sure about Dickinson. Of course, there were differences in the kind of people who chose the different authors, but even after controlling for race, education, income, and age, people who chose Morrison or King were more likely to say that Obama should be re-elected. The survey also had some questions about approval or disapproval of Obama's performance in various areas, as well as Democratic and Republican positions on health care, and the same pattern showed up with those (there were no clear differences among those who chose Twain, Hemingway, or Dickinson). So as my last post suggested, people who read Stephen King tend to be on the liberal/Democratic side. However, this doesn't show up with self-rated political ideology, on which people who chose King were essentially the same as the rest of the sample. The Vanity Fair/60 Minutes surveys often include unusual questions, and this one also asked "If you could choose any of the following places and times in history to return to, which would you choose -- 1. Arriving in America on the Mayflower, 2. The Summer of Love in 1967, 3. Ancient Rome, 4. When dinosaurs ruled the Earth, 5. The Wild West, 6. The Roaring Twenties, or 7. The best time and place is here and now?" In the sample as a whole, 45% chose here and now; the 20s, the Summer of Love, and the Wild West were roughly tied for second with about 13% each. People who chose King were less likely to favor the present (35%) and the Wild West (9%), and more likely to favor the Summer of Love (23%). To summarize, it seems that people who like Stephen King are not strongly ideological, but are kind of discontented with the way things are. That could explain their tendency to favor the Democrats.